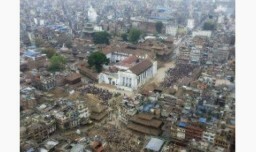 BHAKTAPUR, Nepal — Nepal on Monday reopened most of the cultural heritage sites that were damaged in a pair of devastating earthquakes, hoping to lure back foreign tourists. The April 25 and May 12 quakes killed more than 8,700 people and damaged hundreds of thousands of buildings in Nepal, including old temples, palaces and other historical structures that are popular with tourists. Six of the seven UNESCO World Heritage sites closed after the quakes were reopened Monday, Tourism Minister Kripasur Sherpa said.